Thomas Is Racing Down The Tracks For Easter! Thomas and his engine friends reach new heights of fun and adventure in Thomas & Friends™: Up, Up & Away, a collection of four soaring episodes available on DVD, Digital Download and On Demand March 6, 2012 from Lionsgate and HIT Entertainment. The all-new release includes special feature content, activities and fun from host Driver Perkins, exclusive only to the DVD. Timed to the release this spring, five Thomas & Friends toys will also be available so kids can reenact their favorite Up, Up & Away adventures! 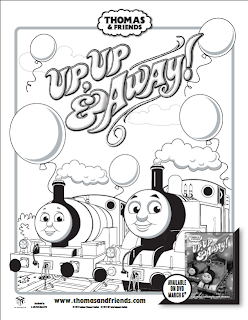 Make sure to print off this fun coloring page to celebrate this new Thomas & Friends DVD! Thomas & Friends: Up, Up, & Away was a really fun DVD to watch! My son loved it and still talks about how Thomas had to learn to be patient in one of the episodes. This DVD taught some great lessons but was fun and enjoyable for children to watch! 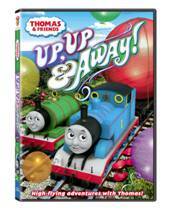 Buy It: You can purchase Thomas & Friends: Up, Up, & Away DVD for a SRP of $14.98.